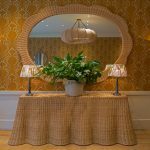 This sculptural rattan design, inspired by the nasturtium flower, is hand-woven by Soaneâ€™s expert Leicestershire rattan weavers. 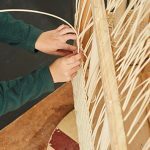 The shade provides uplight whilst also allowing light to filter through the woven rattan. It is offered in a choice of rattan finishes and is a sibling to The Rattan Nasturtium Hanging Light. 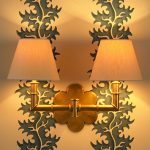 All metalwork is in antique brass. 160mm height x 312mm width. 6Â¼" height x 12Â¼" width. 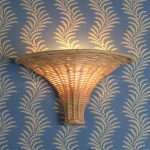 I would like to request a sample of The Rattan Nasturtium Wall Light. Please enter your details below.